Optimal suction means that you never need to vacuum the same area twice. You can choose a system that vacuums both solids and liquids or an automatic central vacuum system connected to your drain that requires virtually no maintenance. Our technologies are all backed by more than 30 years of development and expertise. No matter which vacuum you choose, you can't go wrong with Drainvac! Above-average soundproofing and a range of muffler options mean that our models always give you quiet operation. Our systems are designed to be installed far from the main living areas of your home. You'll soon see that a central vacuum cleaner is a smart investment that adds value to your home. Not to mention the time and energy saved in cleaning. With Drainvac, simply plug the flexible hose into a wall inlet and go! All of our products are designed to meet the stringent requirements of the commercial and industrial sectors. The application of our technologies for domestic use is your guarantee of satisfaction for years to come. The proven performance and reliability of our systems are recognized worldwide. Most of our system components are designed by Drainvac and made to measure in Canada to meet our high standards of durability and quality. They can handle all of your worries! Drains automatically into your sanitary piping. No bag to change, no bucket to empty, everything is done automatically! 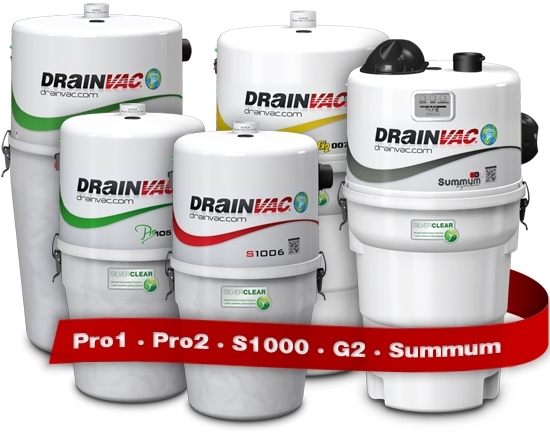 If you're looking for dry-only units, you can view more info on Drainvac central vacuum systems on our site here. If you're looking for attachments for your central vac, click here. If you'd like to talk to one of our experts, please don't hesitate to call us at 1-800-322-2965!